Enjoy some classy cocktails in New Orleans’ famous French Quarter and get to grips with the city’s outstanding cocktail culture. Avoid the tourist traps and visit a heady mix of famous spots, historic haunts and hidden gems with us. You’ll learn about cocktail folklore and hear stories about the ‘The Big Easy,’ both old and new, as you sip away at our favorite local concoctions. 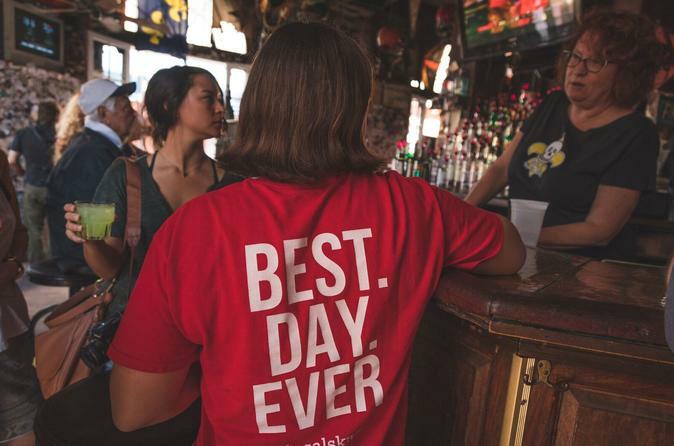 By the end of this thirst-quenching tour, there will be nothing you won’t know about New Orleans drinking culture! You’ll begin your tour in the most iconic spot in New Orleans, Jackson Square. From here, the best and most historic bars of The French Quarter are all within a stone’s throw. Don’t expect to spend much time on Bourbon Street though. While it has its place in New Orleans nightlife, we will be going beyond the tourist trail to show you what really makes New Orleans cocktail culture unique. For our first stop we will travel back to the 1700s and visit a bar which used to entertain some of the most eccentric characters in New Orleans history. Here, we will taste a famous drink of the city and learn how it has influenced New Orleans drinking culture today. In a town bearing witness to many hangovers and a place where it’s socially acceptable to drink at any time of day, it’s no surprise New Orleans has a wide range of delicious dessert-like cocktails. On this tour, we will visit one of your guide’s favorite bars and taste a drink so good you’ll forget there’s alcohol in it. Next up, we will sample the ‘official cocktail of New Orleans’: the Sazerac. One of the first cocktails ever invented, it’s definitely tasty enough to stand the test of time. We will also touch upon the topic of how medicine influenced Sazerac and other cocktails, too. From here, we will taste another classic New Orleans invention, while exploring some of the oldest bars and restaurants in the French Quarter. We’ll also get a behind-the-scenes peek into a courtyard oasis, a stunning hidden feature that makes these buildings special, giving well-known customers a classy room to drink in, hidden away from plain sight. To conclude the tour, your guide will be happy to suggest even more great local creations so you can continue your tour of the extensive New Orleans cocktail trail.